Cooking has never been an interest of mine; I tend to eat pretty simply on my own, opting for Whole Foods salad bars or a quick and easy rice meal at home. Although I enjoy baking and tend to do that fairly often, the thrill of cooking has always eluded me. However, there’s only so much dining out and rice meals a girl can take and so last year I started looking into simple cookbooks. Cookbooks that would appeal to my (simple) taste buds, my laziness, my desire to not own kitchen appliances and the fact I like to eat local, organic and seasonally. Not to mention that the recipes couldn’t be expensive since I was just cooking for one and didn’t want to spend $20 a meal. 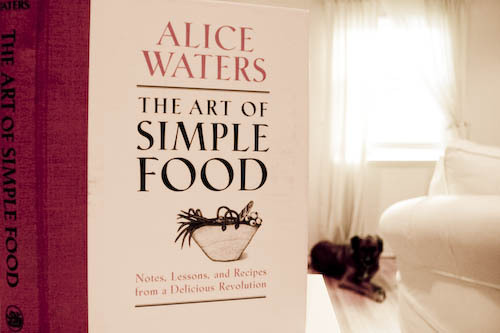 I ended up with a nice collection of cook books but I confess that out of all those books, I tend to go back to just one and one recipe: Slow Cooking Chicken Legs from The Art of Simple Food by Alice Waters. it’s very inexpensive. By using chicken legs, canned tomatoes and just a handful of other basic ingredients, I can get 4 meals out of it all for under $10. it’s ridiculous easy to make and I can do it all in one pot (I use a Staub Elite Enameled Cast Iron 5qt. French Oven which I love). it’s really not time consuming even though the entire cooking time is about an hour. While the legs are cooking, I chop the onions. While the onions are cooking, I chop the garlic. While the garlic is cooking, I open the can of tomatoes and chicken broth. Easy. it’s incredibly tasty, even as left overs. The whole process, I find, is relaxing. It’s a good Sunday night dish to cook and a better Monday lunch. When it’s cold outside, this nicely steams up your kitchen windows and makes your flat smell heavenly – like you’re a bona fide cook. Even if it’s the simplest meal ever. The liquid should reach halfway up the chicken; add more if needed. Bring to a boil and then turn down to a simmer. Cover and cook at a bare simmer or in a 325F oven for 45 minutes. Now, the end of the recipe is: When done, pour the braising liquid into a small bowl, skim the fat. Discard the bay leaf and rosemary. Taste for salt and adjust as needed. Return to the pan and serve. but that’s not what I do. I put a little more chicken stock in so it ends up being like a soup. I take the chicken out, remove the meat from the bones, put into a bowl and then scoop the liquid into the bowl, add some salt and pepper and voila, perfect chicken winter soup. Alice Waters is a godsend. It’s amazing how she can change everything about how one prepares food. She is a genius. That’s a brilliant book altogether, one I definitely want to own soon. Great for the occasional or beginner cook too, as it gives such simple explanation of so many things. Thanks for sharing this delicious recipe! I too cook for one and it is such a pain to find recipes that don’t require a zillion ingredients and leave leftovers that keep and reheat easily (meaning I don’t have to cook so often). I also like “The Eat-Clean Diet Cookbook” by Tosca Reno. Despite the word “diet” in the title, the book focuses on simple, healthy recipes using whole grains and fresh ingredients. The Wehani Rice Salad is especially yummy! I can totally see you getting into the Slow Food movement. Another great cookbook I can recommend that espouses the same philosophy is Pie Every Day. And Laurie Colwin’s Home Cooking and More Home Cooking. They are small and sweet and are meals in their own right.